...and speaking of South Westland skiplanes, on the 4th of February the sad news came through of the death of Alec Miller, long time Franz Josef based national park ranger and skiplane pilot and CEO of Mount Cook Ski Planes. A profile of Alec can be found at the Mount Cook Ski Planes site (http://www.skiplanes.co.nz/About-Us/default.asp) and a tribute page can be found at (http://alexbrucemiller.tumblr.com/). Qantas has made a number of timing changes to the schedule between New Zealand and Australia gateway ports for the Northern Summer period effective from 27 March. Adjustments have been made to facilitate an improved schedule between Auckland and Melbourne, and improved connectivity via Melbourne and Sydney to onward points in Europe and Asia. The morning service has been scheduled for a later departure at 0650, ideally suited to delivering corporate customers in Melbourne at 0900 ready for a full business day. The evening flight to Melbourne has been brought forward to now depart Auckland at 1845 and arriving Melbourne at 2055. This service will connect with the Qantas flight to London (QF29) departing at 2250 six days per week. 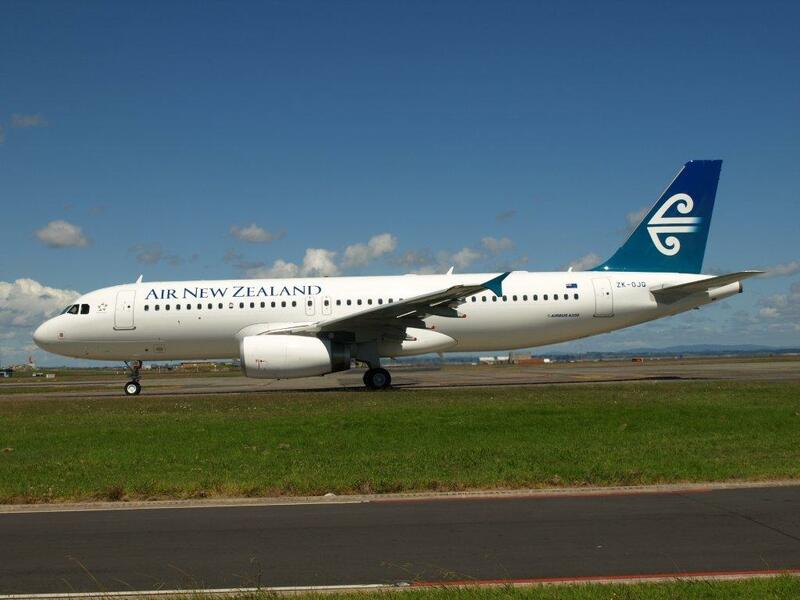 The two evening flights from Melbourne to Auckland departing 1610 and 1805, now leave at 1150 and 1730 providing an improved spread of services through the day. The morning departure remains at 0600, timed for a one-hour connection for inbound passengers from London on QF10. There is an earlier departure at 0800 for the second flight of the day from Auckland, so customers will arrive at 0940 to make the most of their day in Sydney. The A330 service QF114, will depart Auckland at 1245 to provide an improved connection time with Qantas services to London, Frankfurt, Bangkok and Singapore using widebody aircraft all the way. The retiming of flight QF113 from Sydney to Auckland to depart at 1600, improves the spread of flights available on this city pair and is an option for an early business day finish in Sydney. Qantas now operates B737-800 aircraft (73H) on all routes with the exception of Auckland-Brisbane where a B737-400 aircraft is used; and Auckland-Melbourne which operates with a mix of the two types. 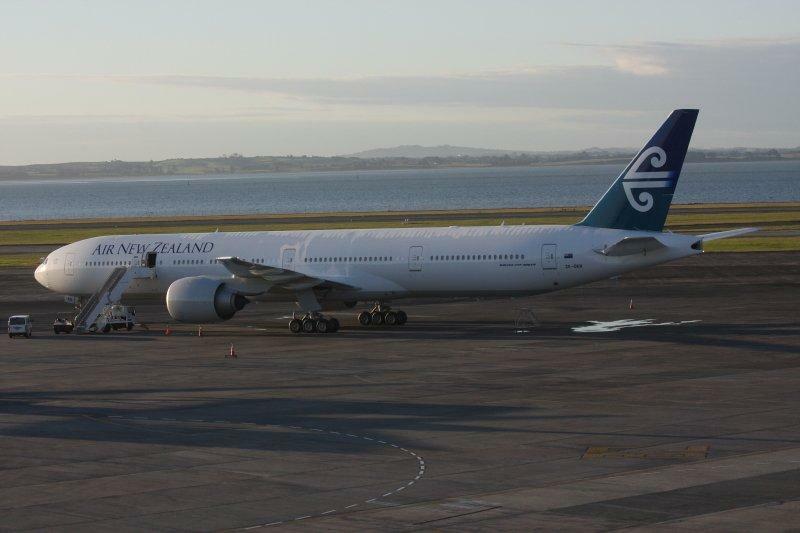 In addition to 73H aircraft flying between Auckand and Sydney, an A330 flight operates six days of the week departing Auckland at 1245 to meet convenient departures from Sydney to Europe and Asia. 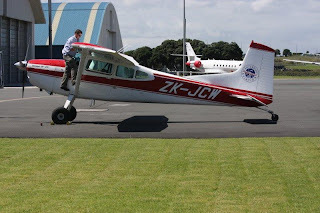 Wayne Grant captured Canterbury Aviation's Cessna 180 in Auckland today (23 February 2011). 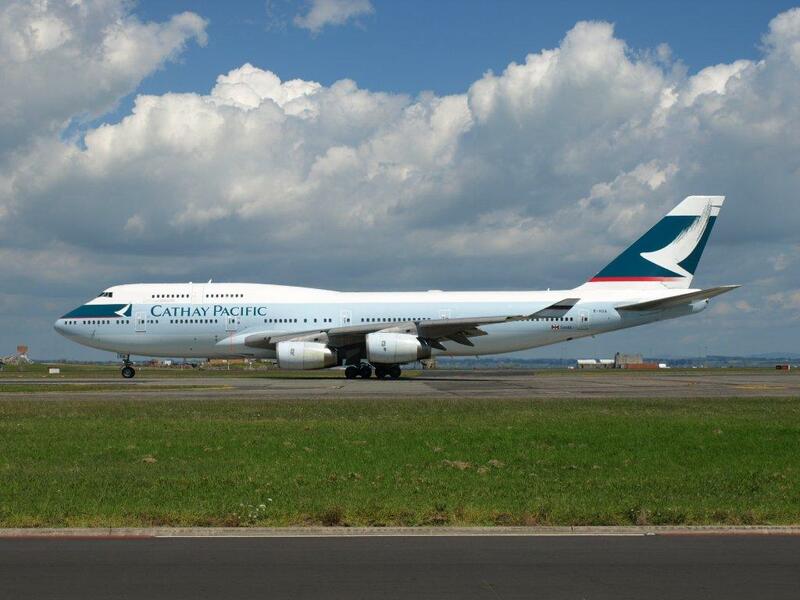 The aircraft was charterd by an American couple to get them out of Christchurch. Found on the Sounds Air website is this interesting combination of two great ways to travel - Sounds Air across the Strait and the Tranz Coastal Express down to Christchurch.. Combining the best of the TranzCoastal with the fastest and most scenic way to cross Cook Strait we are pleased to now offer a fantastic alternative to travelling between Christchurch and Wellington. With our Sounds Air Throughfare, we combine a scenic rail journey onboard the TranzCoastal service with a range of flight options to cross Cook Strait on Sounds Air. 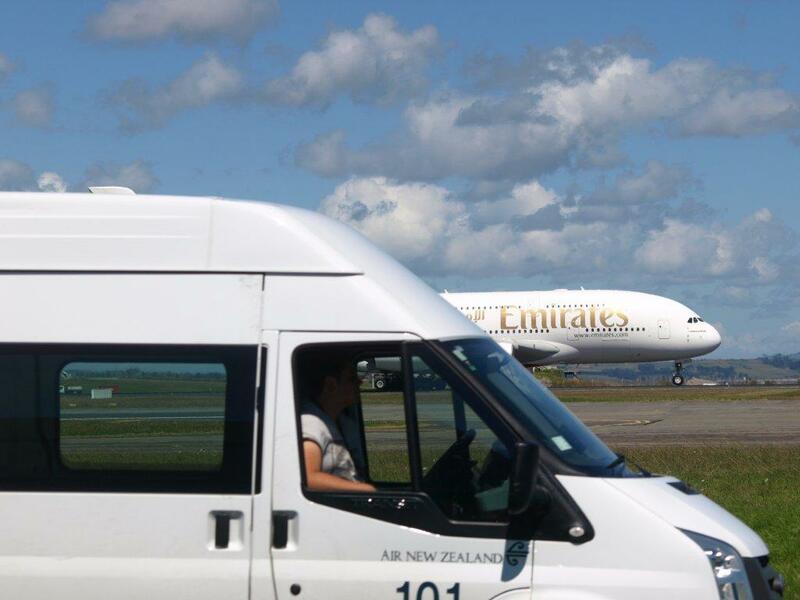 Heading north, we offer travel from Christchurch and Kaikoura to Wellington and vice versa. The flight takes just 25 minutes and you will enjoy panoramic views of the Marlborough Sounds as you cross Cook Strait. With up to 8 return flights per day, there are many different options for enjoying Picton and the surrounding wineries. 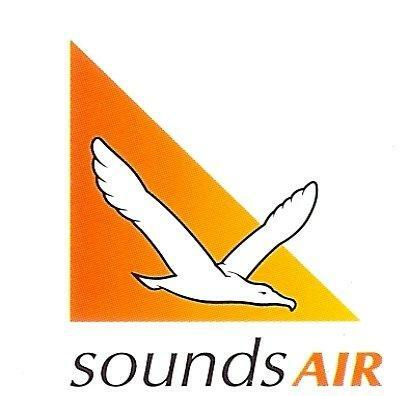 Sounds Air offer Tranz Scenic customers a complimentary shuttle between Picton railway station and Picton Airport. My thoughts are prayers are with you... I hope you and yours are all safe. The Seneca has just arrived in Auckland, on a ship as you say. It will be sometime before we get it online. We are taking the opportunity to paint it while it is being reassembled, plus a few things for Part 135 compliance. Gary Peacock started flying in 1968 at Motueka, gaining his commercial pilot's licence in 1980. 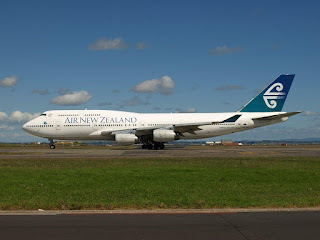 By the early 1990's he was flying part time for N B MacDonalds Services Ltd who had a databank and NZ Post contract delivering mail and bank data begtween Napier, Wairoa, Gisborne and Tauranga. 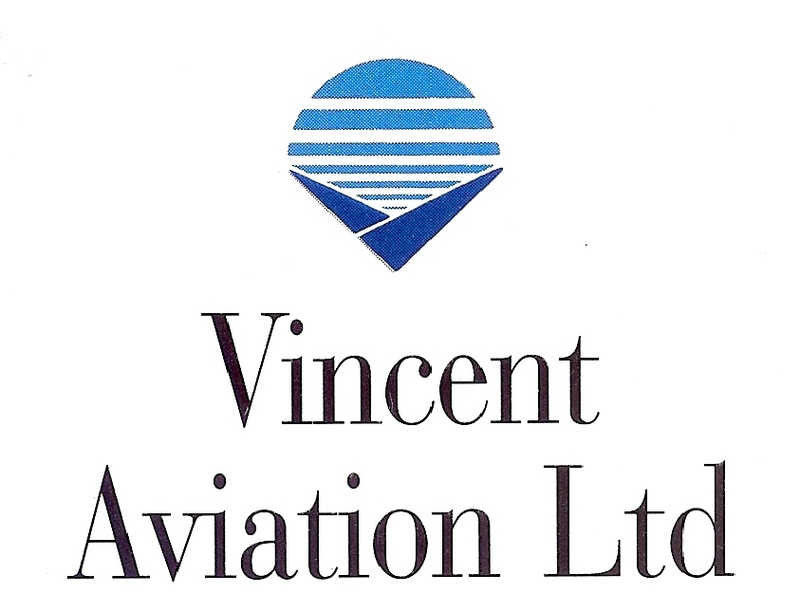 In April 1993 United Aviation took over N B Macdonald Services’ courier run while Alan Coombe, Gary Peacock and John Finlay purchased Piper Seneca Pa34-200T ZK-MSL. United Aviation chartered the Seneca to continue to operate the evening Databank run from Napier to Wairoa, Gisborne and Tauranga with the aircraft overnighting at Tauranga and returning early the next morning. The aircraft was then available for daytime charter work from Napier. Two months later, however, Electronic Data Services closed their branch in Tauranga ending the courier service. Air Napier Ltd was formed in 1994 with Gary Peacock eventually becoming the sole shareholder. 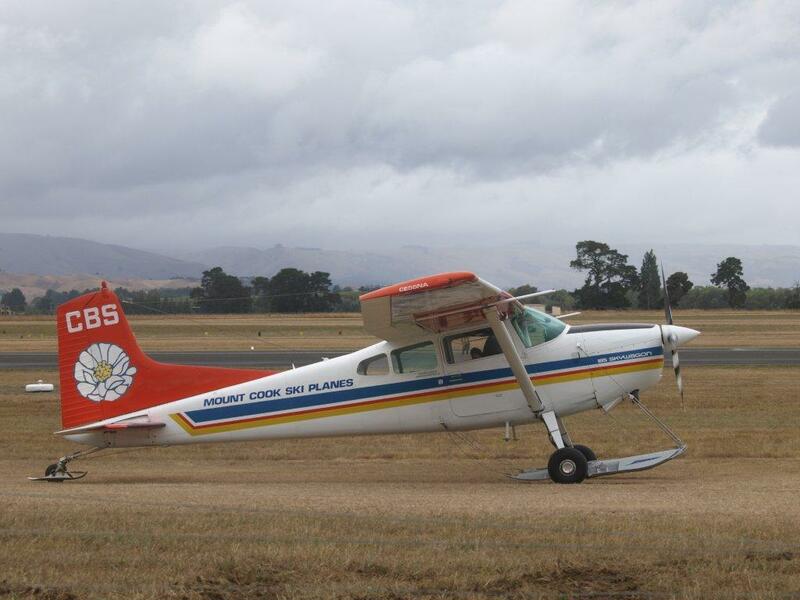 Above, Piper Seneca ZK-MSL in its original Air Napier colour scheme at Napier on 19 December 1993 and below, at Gisborne on 14 November 2007 in its present scheme. In 1997 the company expanded into flight training with the purchase of two Piper Pa38-112 Tomahawks, ZK-TAW and ZK-WAJ. The training was further expanded in 1999 when the Napier Aero Club was looking for an organisation to provide flight training. Air Napier registered an interest and upon acceptance of their proposal moved into the Aero Club rooms from where they provided pilot training and the operation of their air charter business. During these years Air Napier gained CAA 135 certification for air transport operations and CAA 141 certification for flight training. 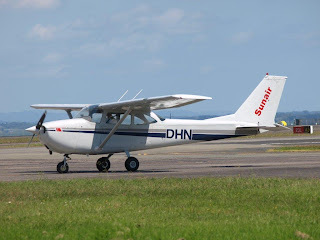 Eventually Cessna 152’s became the mainstay of the training operation while a Piper PA-28-181 Archer, ZK-FIX, and at various times, Cessna 172 aircraft were and continue to be used for general charter work. 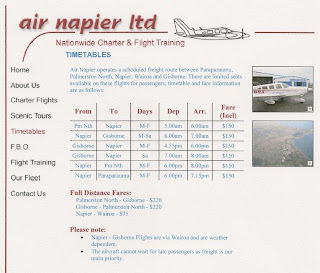 With the grounding of United Aviation in 1997 Air Napier began operating a courier run from Palmerston North through Napier and Wairoa to Gisborne in the morning with a return evening service flying the reverse route as far as Napier, the continuing to Paraparaumu before returning to Palmerston North. In 1998 Air Napier purchased Piper Pa32-260 Cherokee 6 ZK-ELK. Piper Pa23-250 Aztec ZK-JEI was also used from late 1998 till September 1999. These flights were mainly for NZ Post. Above, Piper Pa32 Cherokee 6 ZK-ELK in its original scheme, at Gisborne on 9 February 2001 and, below, in the new scheme again at Gisborne on 25 November 2011. Pionair Direct's Piper Aztec ZK-JEI which was used by Air Napier in 1998 and 1999. Taken at Napier on 8 January 1999. To meet the demands of this service Piper Pa31-310 Navajo ZK-DOM was added to the fleet in February 2000 and Piper Pa34-200T Seneca II ZK-WUG in October 2002. Above, Piper Navajo ZK-NPR in the scheme it operated in for Flight Corporation taken at Napier on 8 February 2001 and at Gisborne in its present scheme on 31 August 2010. The timetable for the "new" service which was introduced in 2001. 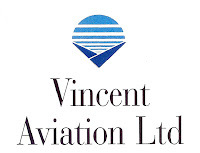 At the end of April 2002 the company relocated to a larger purpose built hanger and administration facility adjacent to the Napier control tower. The modem building gave each instructor an office while trainee pilots had a large lecture room with separate rooms for flight planning. A lounge area was provided for passengers or trainee pilots while waiting for an aircraft. 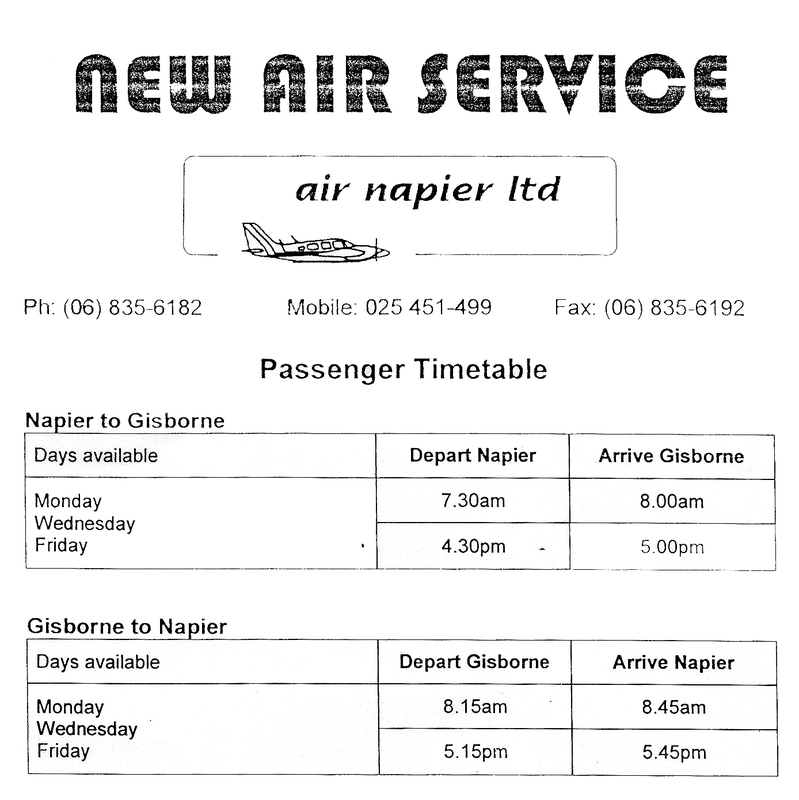 In early 2001 Air Napier introduced a Monday, Wednesday and Friday twice daily commuter service between Napier and Gisborne to get an increased share of traffic on the route. The service was not successful and did not last long. 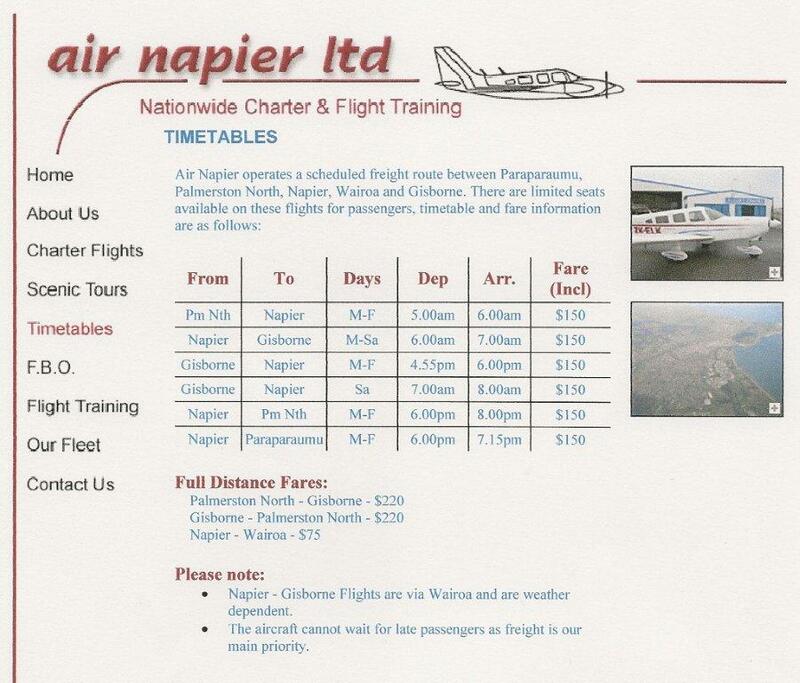 The Air Napier timetable as found on their on the 8th of November 2006. The timetable is no longer a feature of the website. 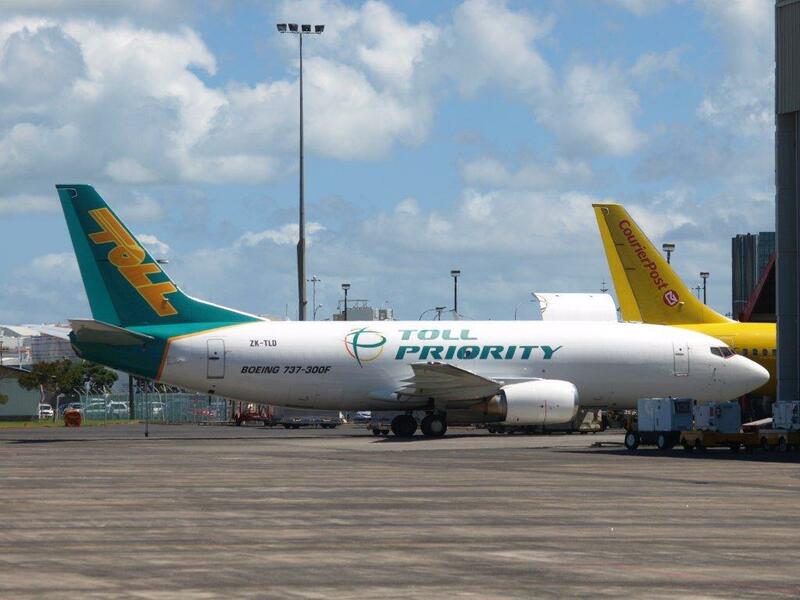 At times the freight flights between Napier and Gisborne involve two aircraft with one flying direct with the other flying via Wairoa. In September 2008 there were changes made to the East Coast courier services when NZ Post lost the last of their bank contracts to NZ Couriers. 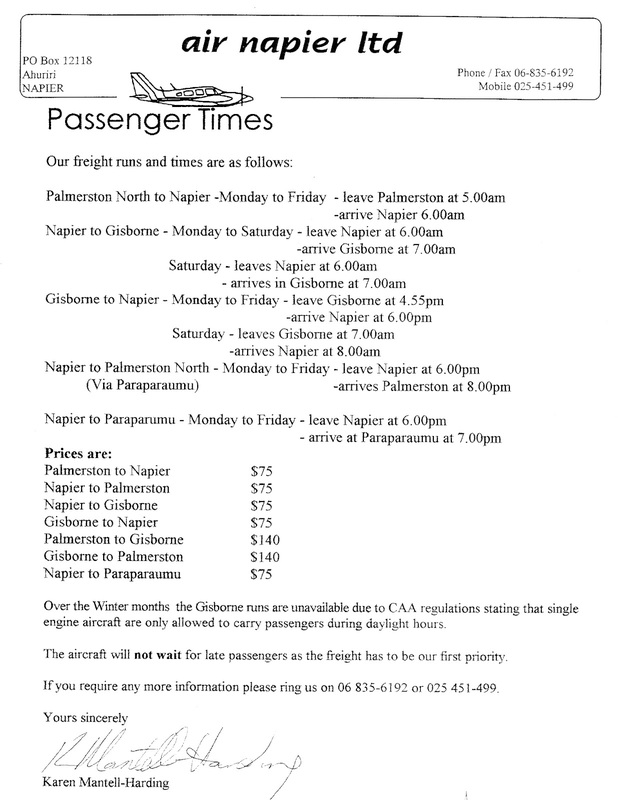 Air Napier became the sole courier freight carrier between Napier and Gisborne, with flights direct or via Wairoa, carrying both the NZ Couriers and NZ Post courier freight. Southbound, at Napier, the freight is transferred to a Sunair flight to carry it to Paraparaumu. 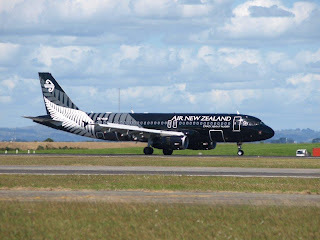 Air Napier continues to fly passengers to and from Wairoa to both Napier and Gisborne connecting at these centres to Air New Zealand Link flights. In addition to the East Coast passenger and scheduled freight services Air Napier continues to offer charter services, medical transfers, aerial photography and surveying, private and professional flight training and providing servicing for international private jet flights to the Hawkes Bay. In 2012 Air Napier took over the contract to convey medical staff between Napier and Wairoa. This involves a Seneca flying to Wairoa on most week days. 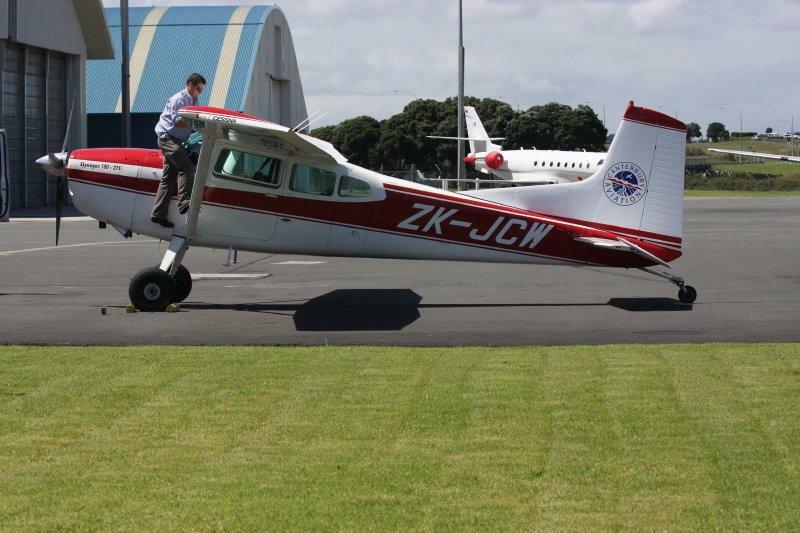 2012 also saw the introduction of Cessna 162 Skycatcher ZK-SKC to the training fleet. In mid-2016 Air Napier sold its training aircraft and ceased flying training. On the 10th of November 2016 the Wairoa NDB was decommissioned and the courier flights between Napier and Gisborne no longer land at Wairoa. Air Napier changed hands on the 2nd of November 2018 with Gary Peacock selling the Napier-based airline to Shah Aslam who immediately signalled growth for the airline. 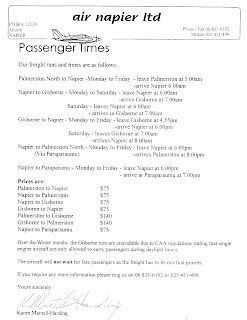 Regular dedicated passenger flights were reintroduced between Napier and Gisborne from the 30th of January 2019. 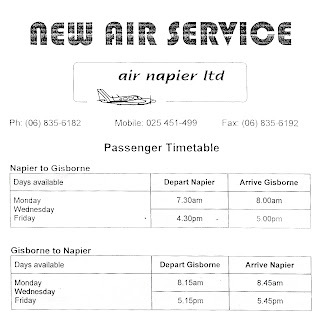 Within days the company was "blown away with inquiries about the new service — particularly with an unexpected call from Gisborne for a possible 'school run' by air." Chief operating officer Mike Brown told the Gisborne Herald that "the aim of last Wednesday’s soft-launch was to establish what demand there was for the Napier-Gisborne route, as well as potential new link from Gisborne to other regions. The amount of email we’ve had and phone calls, we had to put extra staff on over the last few days, has been phenomenal. I mean we got asked for a ‘bus route’ because there are so many kids going to private schools in Hawke’s Bay and they are only spending one day a week with their parents, the rest of the time they are at school or sitting in a car. So, there are all these new things that have come out of it.” Brown said the airline was also open to working with community groups. “So far the response has been extremely good — phenomenal to be honest. “It’s been very refreshing — from the Mayor to the unique set up with Eastland Group and the i-Site guys. Everybody is singing off the same song sheet and that makes it easier for people like us. Over the years the fleet has included the following aircraft, the current fleet indicated in bold. Piper Seneca ZK-WUG taken at Wairoa on 23 January 2013. Registered to Golden Bay Air yesterday as ZK-ZAG was Piper Pa34-220T Seneca (c/n 34-8333002). The aircraft was previously C-GOKO. Wayne Grant captured Air New Zealand's new Boeing 777-300 at Auckland on the 17th of February 2011 shortly after its arrival. The Appeal Court judges, Terence Arnold, Ellen France, and Rhys Harrison, said in the reasons they released today for their decision that CAA concerns about safety could just as well extend to training or competencies as to defective aircraft. 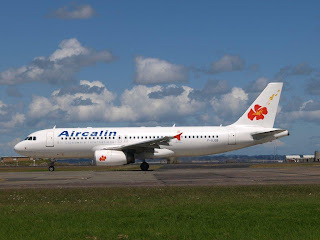 They did not accept that CAA was obliged to carry out its full investigation of whether there was a systemic problem, before suspending the airline operations. "He had material which indicated there may be such a problem". "Although the evidence is at this stage incomplete, we do not consider that Air National has demonstrated that it has a strong case that the decision to suspend was not reasonably open to the director, or was irrational," they said. An Air New Zealand plane has undergone an engineering check in Rotorua today after it was turned back en route to Wellington. The Eagle Air Beech 1900D aircraft was carrying 19 passengers, including Transport Minister Steven Joyce and Rotorua MP Todd McClay. About half an hour into the flight, the aircraft turned around to head back to Rotorua as a precaution following an indicator light in the cockpit. 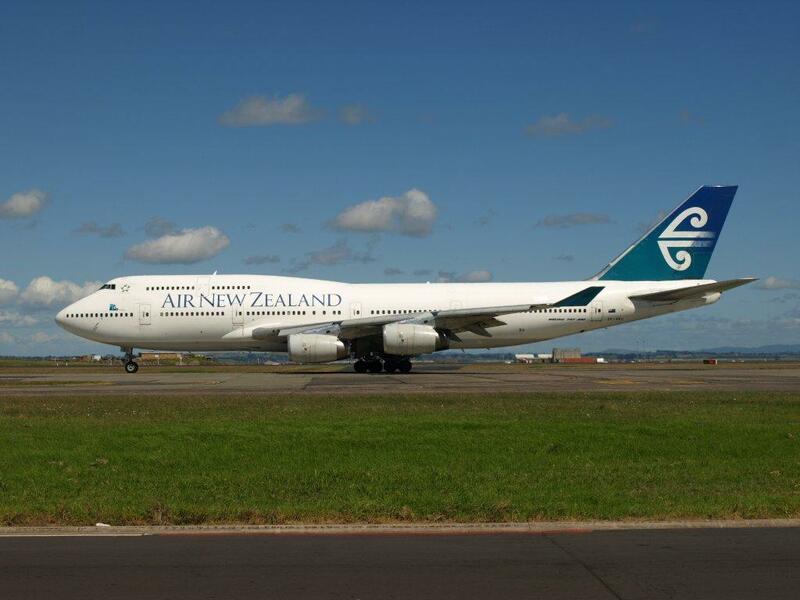 Air New Zealand says it was standard procedure by the pilots to return it to Rotorua for an engineering check. All passengers were checked onto a later flight to Wellington. You really have to wonder; is this news??? When I get a indicator light come up on my car's dashboard I have never read about it in the newspaper. Granted I don't usually carry 19 passengers in my Corolla. Nor have I seen a news report on buses that have broken down or had indicator lights appear. Like all responsible drivers these pilots were responsible and eveything was done to ensure passenger safety. What such reporting does is encourage fear of flying in "little planes."